Azerbaijani President Ilham Aliyev has affirmed that the government will continue to provide support to entrepreneurs. 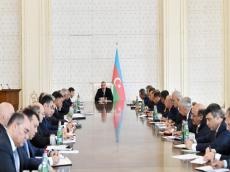 “A total of 2.2 billion manats have been allocated to the Entrepreneurship Development Fund so far,” the president said at the meeting of the Cabinet of Ministers dedicated to results of socio-economic development in the nine months of 2018 and objectives for the future. The president said that this year lending is also successful, adding that there is a lot of demand. Thanks to the activity of the Entrepreneurship Development Fund, thousands of jobs will be created in the country next year too, President Ilham Aliyev said.